It’s amazing how technology can influence and change our perception and creativity of things, including sewing and fashion! If you teach sewing and/or fashion, below are some ideas of how technology has influenced or become a part of the art. At one time these ideas may have existed only in our imaginations and now they are reality! If you know of other ideas or resources available, please share via the comment section below. Ted Talk: Danit Peleg: Forget Shopping. Soon You’ll Download Your New Clothes! Virtual Fashion Show (Google Slam): Try clothing on with a projector! Snapfashun Edu: Allows you to turn your creative ideas into virtual garment designs using an education version available with a subscription fee to. If you teach fashion design, it may be worth the cost. Wearable Electronics with Becky Stern: If you have STEM classes, you may want to check out the wearables on this site! Pretty cool! 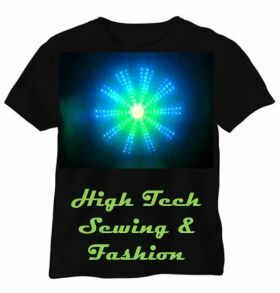 Make Your Own LED Clothing inexpensively…provides resources for affordable lights especially if using in a STEM project. Here’s another YouTube Clip describing 5 Futuristic Wearable Tech Inventions. It might be interesting to have students design some other wearable tech inventions for the future as a creative project. Sew Electric unique resources for introducing electronics and programming with DIY projects for students such as bookmark book lights, sparkling bracelets, and interactive stuffed monsters. Fashion Design Games for Teens: Fashion show games, be a ramp model, simulate fashion shows, and more. This might be a good resource for those early project finishers! Brown Dog Gadgets has kits for conductive sewing and young learners.